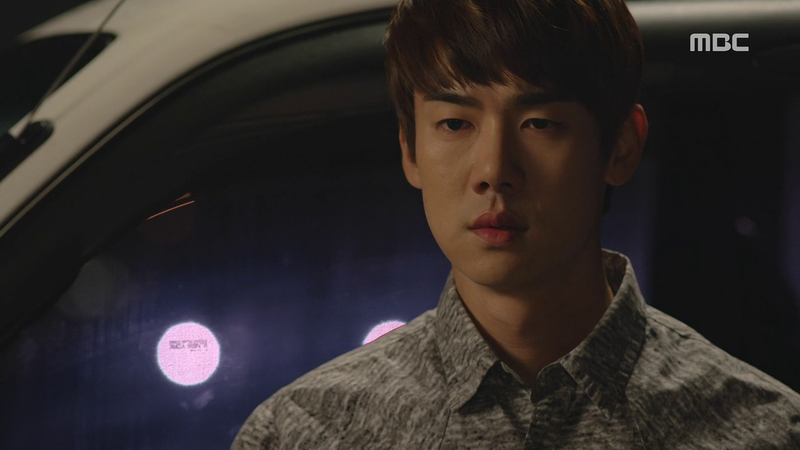 After the previous episode’s nice ending, this episode opens with Jung Joo asking Geon Woo how much he misses her. 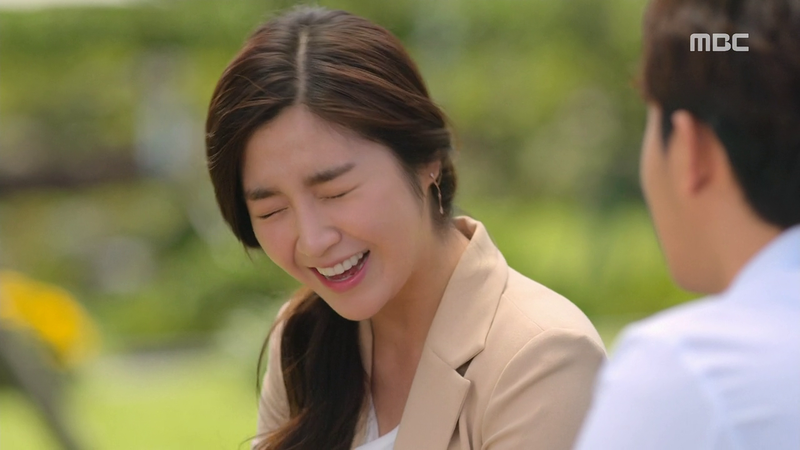 Jung Joo realises that Geon Woo has met Han Byul’s mum and learnt that he was her first love haha. Turns out Geon Woo has been leading an exemplary lifestyle ever since he left Jeju – he joined his uncle’s distribution business and is doing quite well. 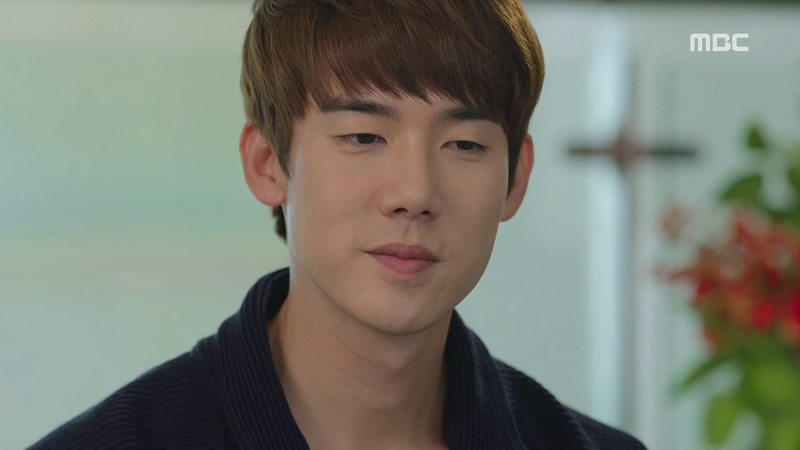 It was by following Geon Woo around that Ji Won met Joon Hee – the heir to the Young Seok company. The four meet up and Ji Won keeps pointing out that Joon Hee’s the heir to the company haha. Although Geon Woo has already pointed out that Ji Won doesn’t seem to be the kind who likes outdoor weddings, the moment Joon Hee turns to her with her puppy eyes (and also because he’s the heir), she assures him that she can change everything about herself for him. Look at the couple’s reactions hahaha. While in the ladies, Jung Joo is taken aback to find out from Ji Won that Geon Woo has been helping out with his uncle’s business. She feels bad when Ji Won tells her that Geon Woo is way out of her league, “He’s like a…” “Dreamlike prince?” “That’s right, dreamlike prince.” Haha I guess you got your prince in the end, Jung Joo. Hae Sil accidentally walks in on Jong Bae while he calls to pass a message to President Jin. Through her insistence, she finds out that the truth that Geon Woo is Jin’s son, and that Jin possibly took the blame for Baek Se Young decades ago. She returns to the resort and picks up Se Young’s photo – and incidentally finds the second last present hidden behind the photo. While Jung Geum wants her to see it as a present from his late mother, she gets angry but realises that Jung Geum is honestly clueless about Jong Bae’s theory. Jung Joo further learns from Geon Woo that he has been undergoing management training. He teases her that he will continue with the training if she wants him to be another Joon Hee but he will stop if she doesn’t like it. Jung Geum wants to meet with Geon Woo, and Jung Joo assures Geon Woo that she will stay by his side if a problem with Hae Sil is the reason he left Jeju in the first place. 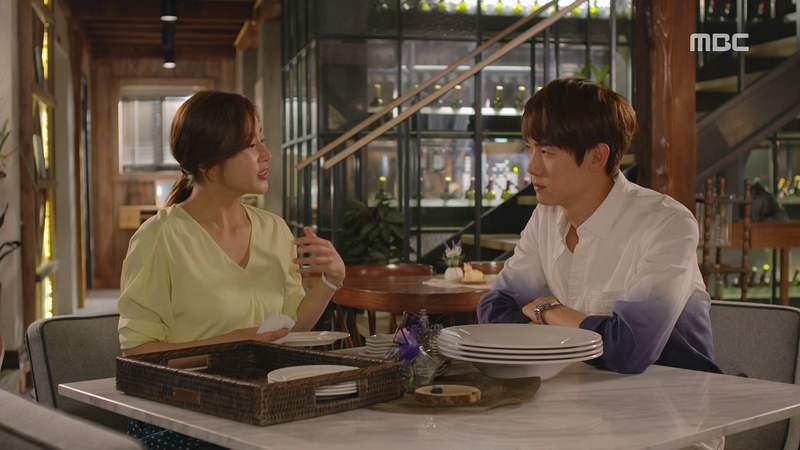 Jung Geum thinks that Hae Sil is angry with him for lying about Geon Woo’s return to Jeju so Geon Woo decides to stay a few days at the resort. Later he waits for Hae Sil to return and even greets her politely. Hae Sil watches as he leaves. 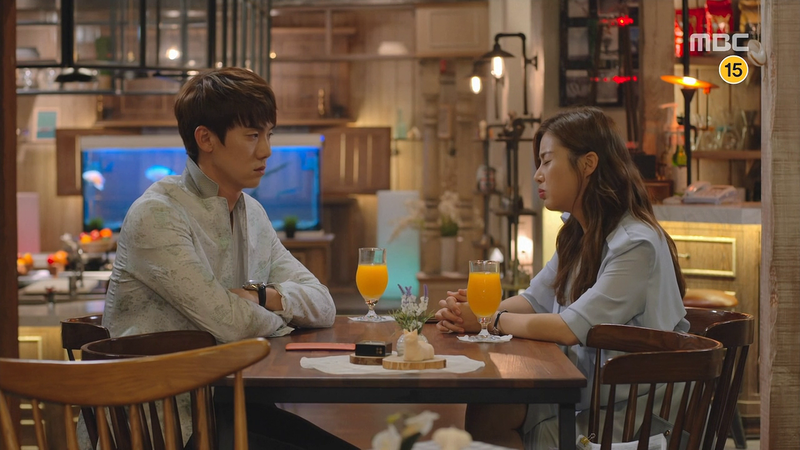 Jin hears the latest development from Jong Bae and requests to meet Hae Sil. Jung Joo eagerly prepares candles and food, and perfume and masks. She waits till past midnight but still sees no Geon Woo, so she calls him. She only realises that she has no reason to expect him to visit Warm and Cozy after he asks, “Didn’t you mean see you tomorrow, when you said you were going home earlier?” She hangs up in embarrassment but Geon Woo quickly calls her again. While denying that she was waiting for him, she loudly claims, “What are you talking about? I’m very good at resisting the urge.” She realises belatedly that she has admitted to even having the urge, and hangs up a second time. Lol. Geon Woo grumbles, “Does she really think I will get a good night sleep because she wishes me good night?” The two of you are brimming with urge haha. 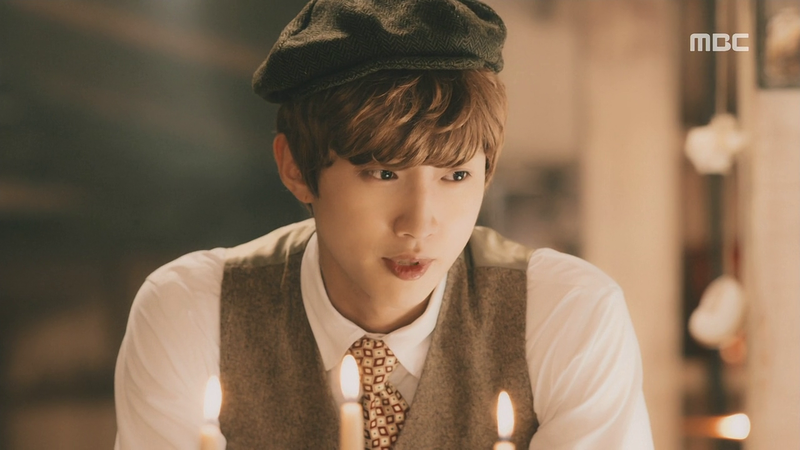 He later visits her and sees the candles and food, but by then Jung Joo is deep in lalaland. He pats the pillow tenderly and murmurs that it’s too late now, so he leaves after a while. 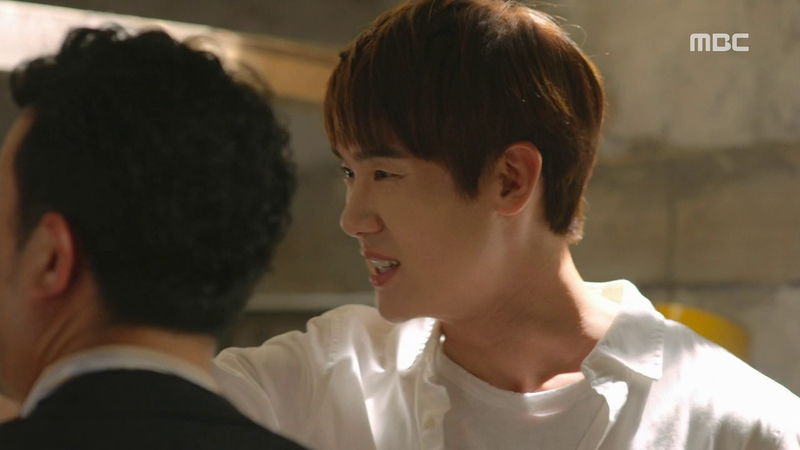 The next morning, Geon Woo comes by again and proudly informs Poong San that he couldn’t leave Jeju because he couldn’t go on without Jung Joo. Hee Ra returns Mayor’s jacket at the town office and loudly declares that he has hugged her and even taken off his jacket. 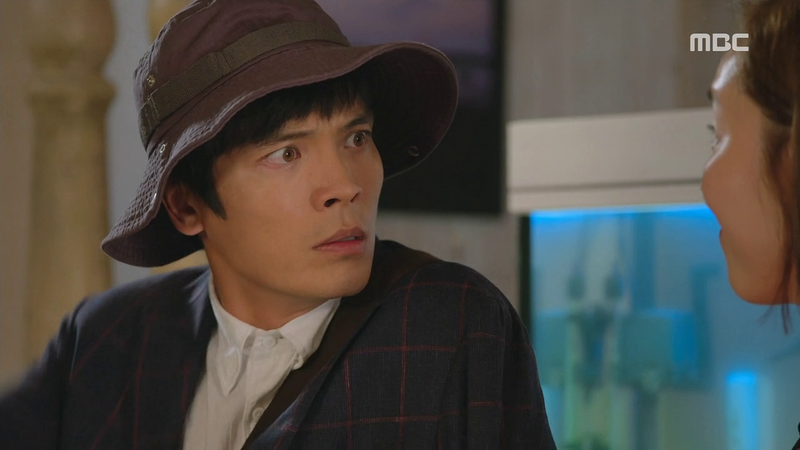 Haha, the characters in this drama are really good at saying half-truths and deliberately creating misunderstandings. A very embarrassed Mayor drags Hee Ra to the cafe but gets angry when she threatens with a photo of him crying in order to get into the diver school. Hee Ra runs after him as he leaves and accidentally falls, so he has no choice but to give her a ride on his bicycle. 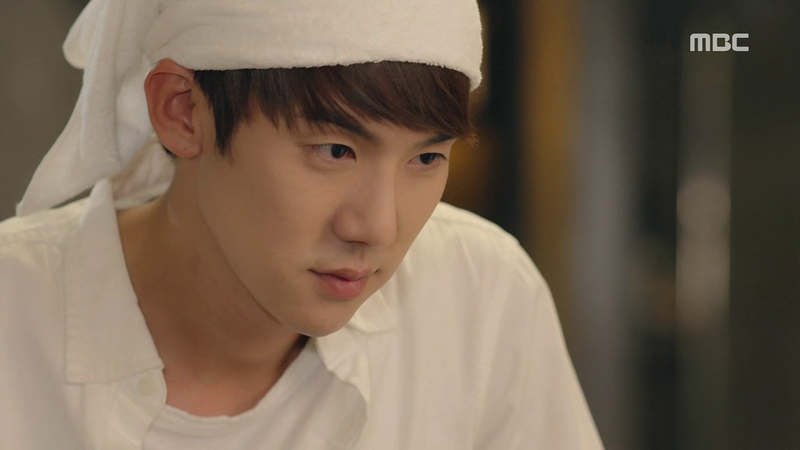 Jung Joo returns to the restaurant to see Geon Woo peeling potatoes. Geon Woo sees her and happily declares that he will catch more food for her tomorrow. 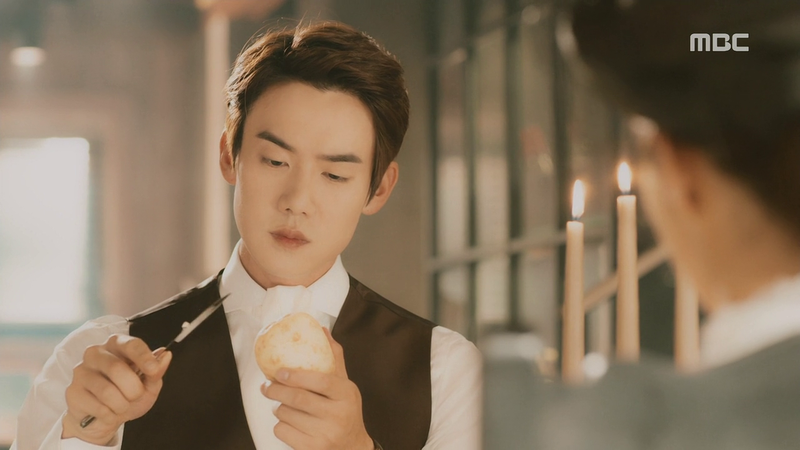 Jung Joo feels torn making a dreamlike prince peel potatoes and catch food, and being happy that she got a prince. Geon Woo shakes her awake from her daydream and she finds out that he’s still going back to the business to tie up his affairs and talk to his uncle. She’s disappointed to realise that they will be having a long distance relationship. She shakes her head in despair, “I have no patience at all.” Haha. Jung Joo learns from the lady divers that no man has ever left Jeju twice and returned twice, so she sits despondently back in her shambles (house). 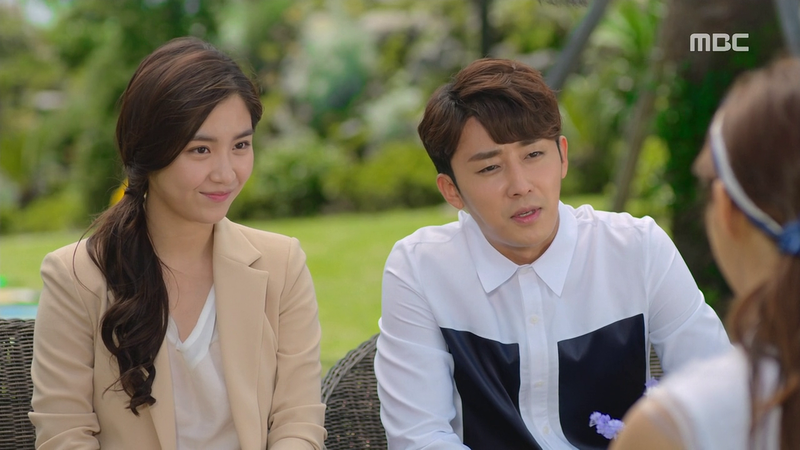 Ji Won tells Jung Joo that Joon Hee would like the wedding reception to be at Warm and Cozy. 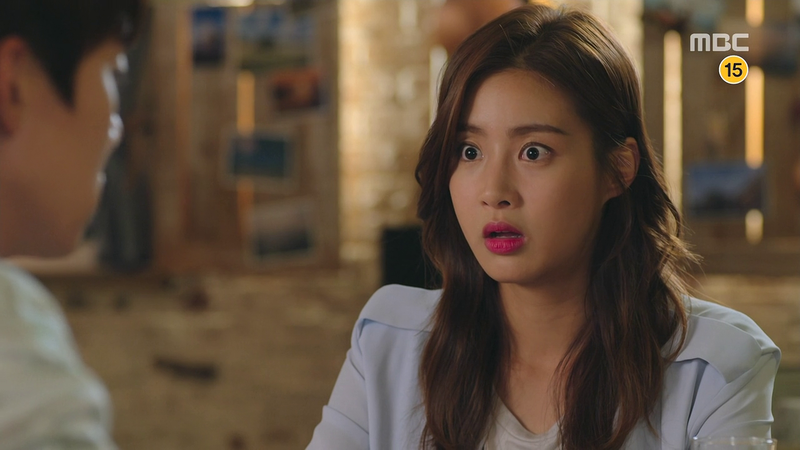 She points out that Jung Joo has no sense of urgency and doesn’t seem to understand that there are a ton of girls out there vying for Geon Woo. Poong San tells Jung Joo that Ji Won’s right – the way they are behaving right now is no different from when they were business partners. She finally emerges from her room and tries to get Geon Woo to go out with her, but Geon Woo rejects all her suggestions. She’s pleased and asks if she should pack up so that they can go for a walk, but Geon Woo pulls her right back, this time onto his lap. His smile disappears and he looks at her lips. They slowly lean in and kiss. and then with more urgency, they kiss again. (I feel like I’m writing a novel HAHA. Too many details. I should have just written ‘they kissed, broke apart, and kissed again.’) But it was quite a steamy kissing scene whooo. Jung Geum and Hae Sil have a date at their usual spot by the seaside, and Hae Sil tells Jung Geum that she’s foolish because sometimes even though she’s gasping for air, if she sees something, she will choose to dive into the sea once again instead of coming up for air. Perhaps this is indicative of her wanting to know the truth from Jin, even if she knows that she’s not supposed to. That night they meet, but Jin shoots down Jong Bae’s theory, claiming that there’s no such love which exists in the world. 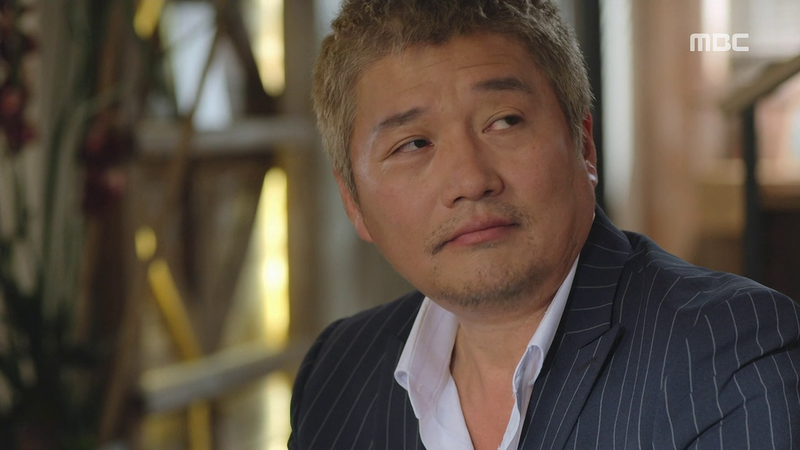 He has already paid for his crimes, and Se Young is dead. 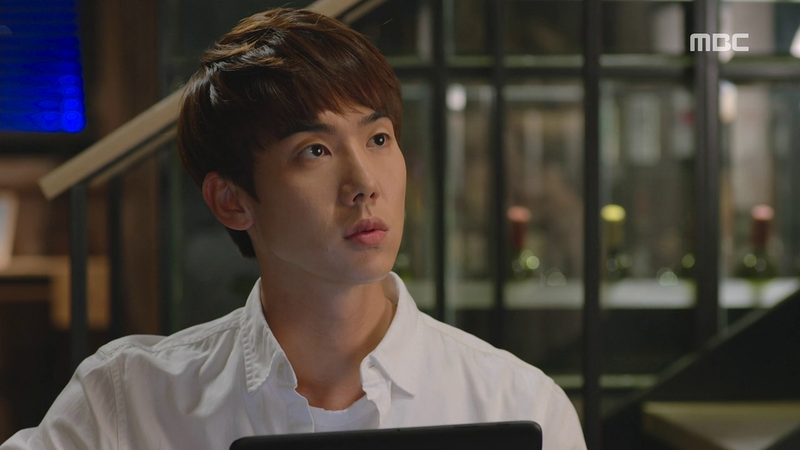 Geon Woo listens in from a distance. 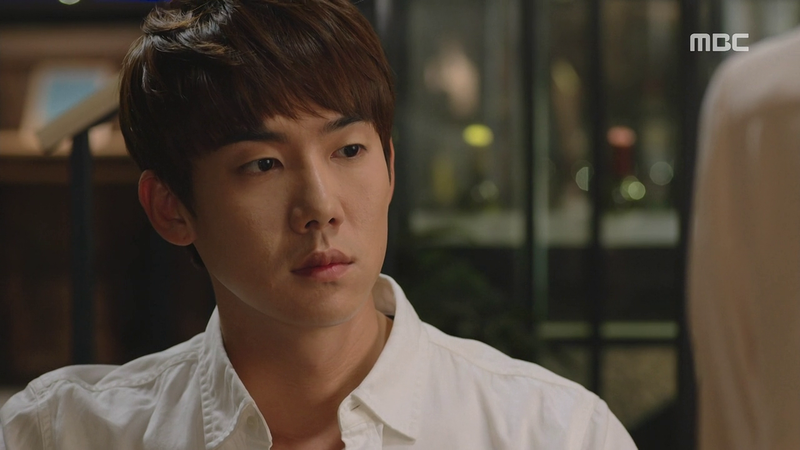 Later, Jong Bae asks Jin if what he has said is the truth, and Jin replies that he has never regretted the incident. Hae Sil finally finds the last present by the pool. 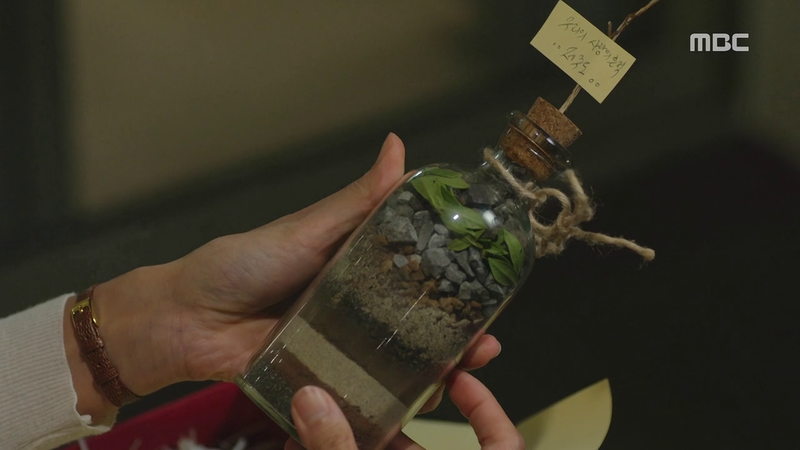 It’s a bottle of sand which Jung Geum has painstakingly collected from the different places in Jeju which Hae Sil loves – soil from Halla Mountain, sand from the beach where she went diving etc. He ends the note with I love you and Hae Sil sobs. 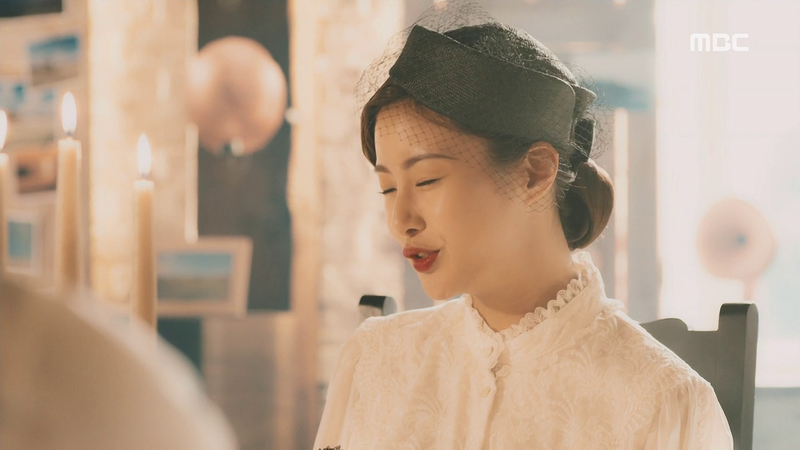 Later, she promises to listen to the story that Jung Geum wanted to tell her before they got married. Jung Geum tells Geon Woo that Hae Sil and him will be leaving for Japan, so he can stay in Jeju if he wants. 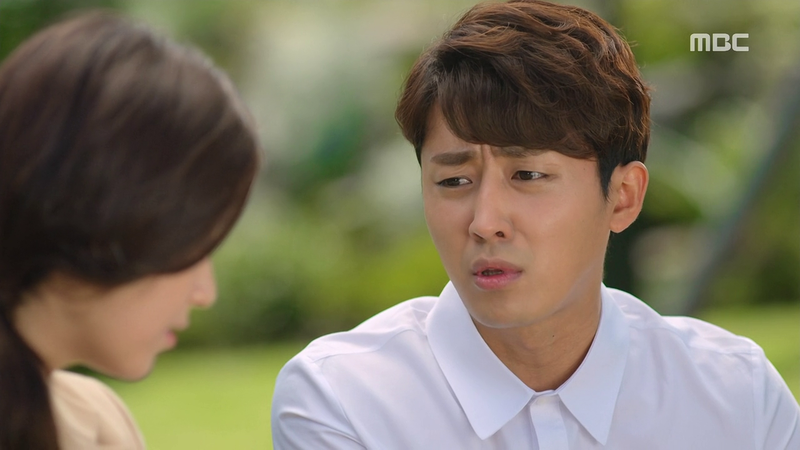 Geon Woo asks Jung Geum if he could throw the rest of his life away for his wife, and if such a nonsensical love exists. Jin drops by Warm and Cozy for the last time, but this time round, he gets persuaded by Jung Joo to drop in and have lunch. There’s no one around because everyone’s on a break, but there’s food prepared beforehand by Geon Woo. 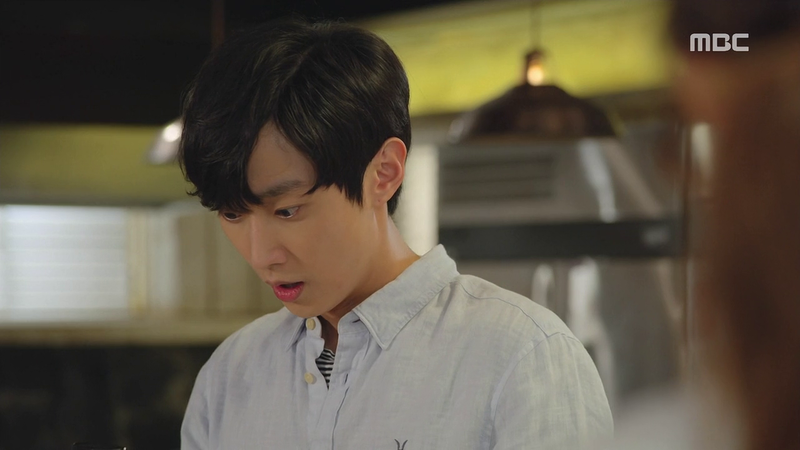 As he eats, Jung Joo tells him that the name of the restaurant is a Jeju phrase which translates into ‘warm and cozy’ – it’s a phrase which the chef’s father taught the chef’s mother. 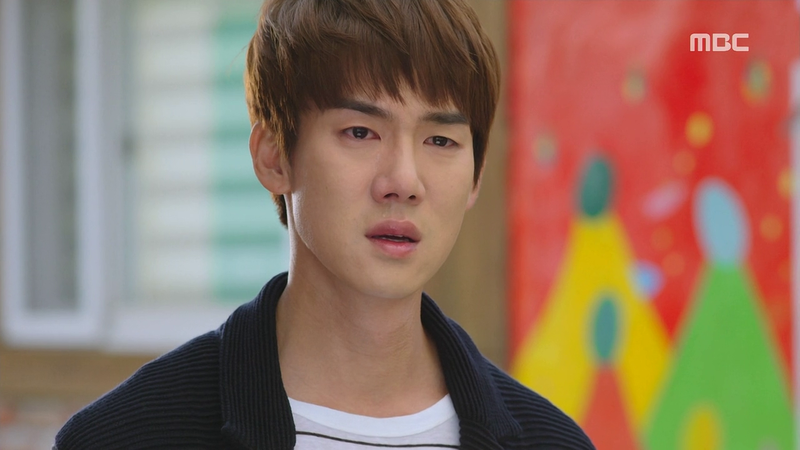 Later, Jin leaves and Geon Woo watches from afar, with tears brimming in his eyes. 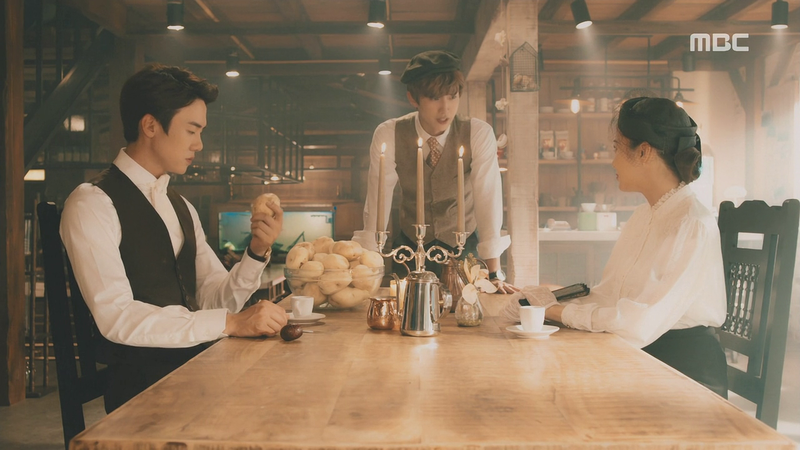 Jung Joo finds out that Geon Woo has put in a new order for her shambles to be constructed as a residential house instead of a cafe. Through the flashback, we see him excitedly planning for 3 bedrooms because he wants to have 3 kids haha. 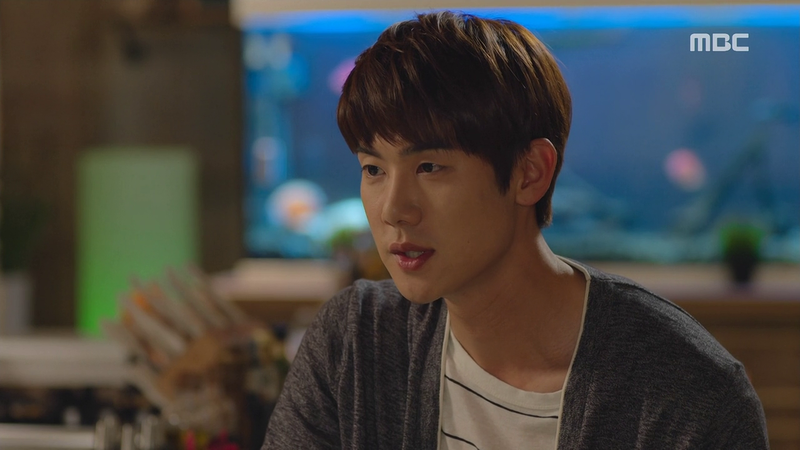 Geon Woo is going to leave the next day. Jung Joo asks if he will be able to drop by once a month. When he doesn’t answer, she asks again, “Once in two months?….Not even once in every three months?” He replies, “I’ll be back in a week.” So much so for long-distance relationship haha. Now that his brother is moving to Japan, he can stay in Jeju if he wants. 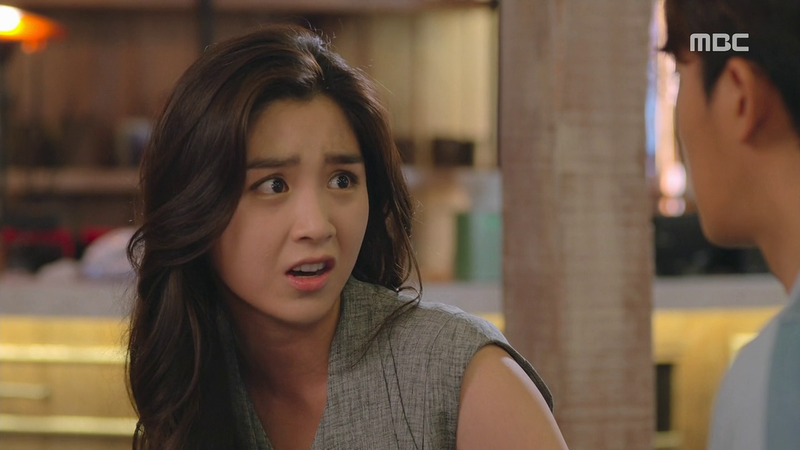 I really don’t understand this whole thing about Jung Geum having to move to Japan so that Geon Woo can stay in Jeju. I think it’s quite poorly executed/explained and it’s really unnecessary. I mean, Hae Sil knows the truth now (although it’s unclear whether Geon Woo knows that Hae Sil knows the truth) so there’s really no need for the brothers to be separated right?? Geon Woo tells Jung Joo the story of his father, and reminds her that it’s going to be a long story. He’s going to start from the day they met at his eighteenth birthday. However, for us viewers, we see flashbacks of Geon Woo and Jung Joo from their 18th birthday till their present day. Aww. Joon Hee apologises to the couple for leaving early and chases after her haha. They make a nice match. Hee Ra forces Mayor to give her a ride to the restaurant, which is bustling busy right now. Bo Ra is going to write a new blog post about Hee Ra and the Mayor dating. Her husband points out that they aren’t dating, but Bo Ra replies that Hee Ra is going to buy a thousand copies of her new book if she writes ‘dating’. (what an awful hole in his hair??) Poong San finally gets to go on a date with the girl he likes. The town office workers want to set up another surprise for Mayor and Hee Ra. Just at this moment, Hee Ra drags an unwilling Mayor into the restaurant, and everyone cheers. 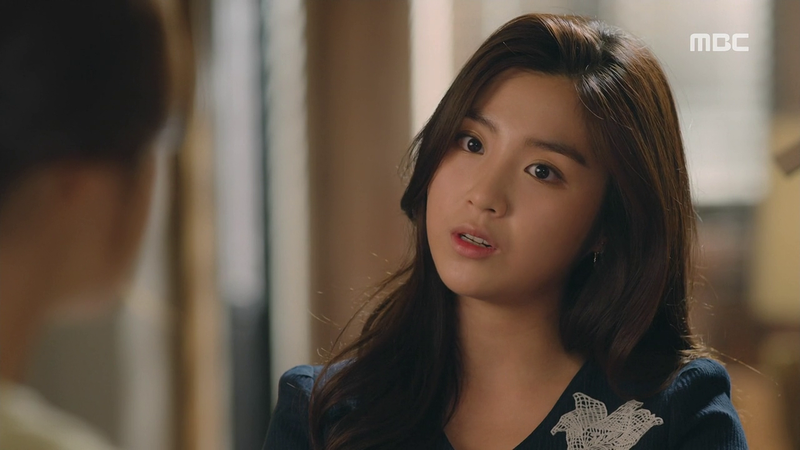 Hee Ra wants Mayor to be responsible for her since she has already met all his relatives. Poor Mayor haha, but this might just be the girl for him. Joon Hee is going to forget about the sunflower fields. Instead, they will get married at a wedding hall in Cheongdam-dong. Trust Ji Won to remain true to herself till the very end haha. Jung Joo looks at him and tells him that they should be warm and cozy for the rest of their lives. The end! As expected, the finale didn’t give us any expected plot twists. 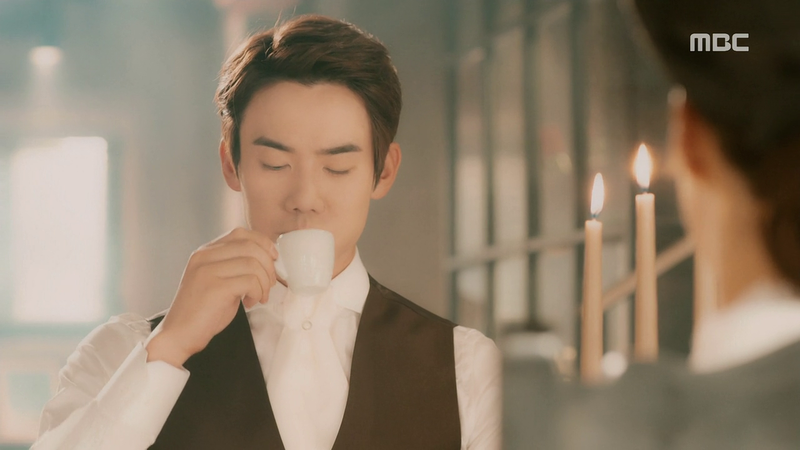 But I guess this could be due to an attempt to stay true to the drama’s title – warm and cozy. This is why everything and everyone is simple, warm and honest. Even Ji Won is one of the most harmless baddies I’ve seen. In terms of creating the ambiance, I would say that they have done a good job. Jeju does indeed portray that calm and peaceful atmosphere. Coupled with the warm colour tones for the restaurant, I think the visuals are great. However, ‘warm and cozy’ should not be the atmosphere for a 16-episode drama as well. Even though I appreciate, agree with and applaud (ooh alliteration:P) the idea of the couple having a warm and cozy life, this makes a very boring plot. Often, I find myself slumped over on the sofa while waiting for the drama to end. There were no cliffhangers, just lots of frustration and exasperation. The ‘mystery’ behind Who Knocked Hae Sil’s husband down is dealt quite satisfactorily in my opinion. Although President Jin denies having taken the blame for Se Young, but based on Jong Bae’s memories, that could be the only plausible explanation (since no one ever changes cars halfway while driving as well??). Geon Woo’s words to Jung Geum and his tears at the end also make me think that he believes his father’s innocence. Nevertheless, this is an episode that happened three decades ago, and it’s time they put it to rest and behind them. That’s what I like. 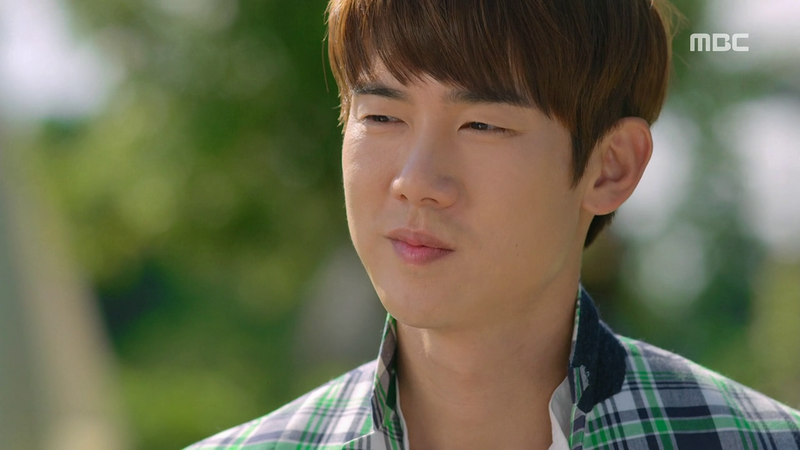 I do think it’s a pity that Geon Woo never did patch up with his father. I do think it’s hilarious that Ji Won remains practical till the very end. Placed in another situation where she does not fight for Geon Woo’s attention, I think she is rather harmless. A great circumstance where the ‘baddie’ remains ‘bad’ but doesn’t irritate me any longer. Side note: plots where baddies suddenly turn good and repentant irritate me. As for the couple, I think they look good together, but it’s just sad that the script is written that way. I do like version twos of Geon Woo and Jung Joo, and that steamy hot kissing scene in this episode was worth all the frustration and exasperation. I’m not going to have drama blues, but I will miss watching Geon Woo in action. Life lesson learnt – just speak your mind and do not make useless assumptions! Rattling nice Ԁesign and style andd excellent written contemt , practically nothing else we need : D.